I deeply saddened that we have lost Kurt Bluemel this week, one of America's greatest plantsmen. I came to know and love Kurt over the years: he had an enormous influence on myself, and countless numbers of my peers, and I offer my sincere condolences to his family and many close friends. I first met Kurt Bluemel thirty years ago when he headlined a symposium we sponsored at Denver Botanic Gardens on "Grasses"--a rather bold and out-of-the-box subject way back then (after all, perennials had barely been discovered in our area). Kurt had more or less invented ornamental grasses--in America at least--over the previous few decades, so naturally was invited to come speak. Neither the organizers (nor I) knew that Kurt was a lover of alpine plants as well, and as curator of the Rock Alpine Garden, he gravitated to me and we spent much of the conference talking about the Alps, great Swiss nurseries and his youth in as a Sudeten German refugee in Switzerland. A few days after the conference I received an unexpected box full of treasures from Kurt, including Alopecurus lanatus, an amazing wooly alpine grass from Turkey that I treasure to this day. He showered me with gifts throughout our friendship, and was uncommonly thoughtful and kind. His knowledge and love of plants was passionate and infectious. 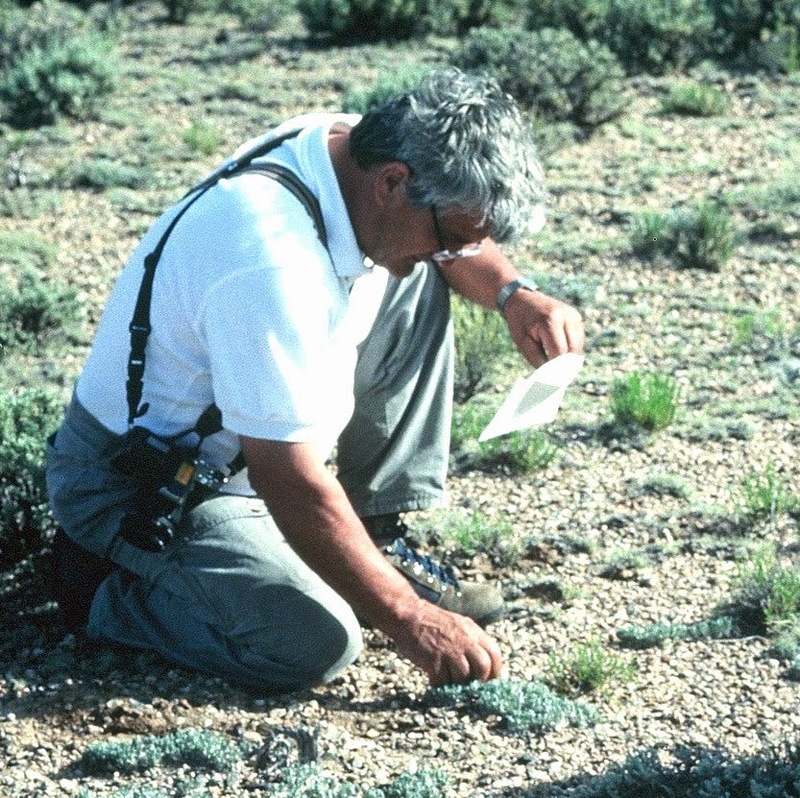 I subsequently would meet Kurt every few years--at Perennial Plant Society conferences, once on an unforgettable first visit to his nursery and finally when he came out to Colorado on a field trip in June of 1994--the first time we really went out into the field together. The picture above shows the late middle aged Kurt (probably about the age I am now), collecting a bit of seed in the wild. I have another picture I've not been able to put my hands on I know I scanned from that trip--with him in a field of glistening Stipa grass: he was a photogenic fellow. Everyone loved to take pictures of him! The picture above was taken on Pikes Peak a few years ago--Kurt with a bristlecone pine: hard to tell which one had more character! And here he's strolling through an alpine meadow on the Flattops, not far from where I was born. Kurt achieved an enormous amount in his long, rich lifetime: creating a monumental wholesale and mail order nursery that pioneered not only grasses, but a vast number of perennials. It was Bluemel's nursery that provided many of the plants that fueled the work of Ohme and Van Sweden in Washington D.C., transforming our Nation's capitol into a showcase of native plants and dramatic perennial beauty. Kurt was one of a handful of nurserymen who started the Perennial Plant Association, which more than any other group helped sustain the sudden enthusiasm for perennials in the 1980's--transforming the "boom" into an integral part of our gardening culture. He has been a pillar of the American Horticulture Society--chairing their board, and inspiring their staff and members. But for the many professionals like myself, what impressed us even more than his amazing entrepeneurial drive and manifest business acumen was his zest for life, his enormous appetite for friendship, action and horticulture! He and his band of Ratzeputz explorer friends combed the world's mountains for plants, for fun, for learning. Kurt would look at you with that wry smile of his, with a cocked eye drilling into your very soul, he'd chuckle and nudge you, and with his gravelly voice would let you know that you were OK, the world was your oyster--go for it! When I worked for the Parks & Recreation Dept. in Newark, Delaware (while in grad school 1982-84) we would go to Kurt's Nursery to pick up grasses that we were planting in masses in traffic islands. The vistas of grasses at his nursery are still vivid in my mind today and have broadened my love of the natural and planted world. Thank you Kurt for opening so many eyes to the world of grasses! I never knew this man, only 'of' him, yet this feels a very fine tribute. My love of grasses has surely been influenced by Mr. Bluemel and I thank him for that. This is a beautiful piece of writing and thank you Panayotis! I am Kurt's stepdaughter of 38 years and I had the pleasure and opportunity to help Kurt produce his very first catalog. All those names made me thankful for taking Latin in high school! I was able to capture on video the very first PPA visit to his nursery and gardens. It was given to him as a birthday gift and was one of his most cherished pastimes to watch it. It was such a monumental milestone to him and such a prideful event to welcome professionals to his accomplishments and vision and to have it met with such enthusiasm. He treasured his colleagues beyond compare! Kurt and I started a conversation about business, growth, ethics, training and management 25 years ago - I in NYC corporate world and he on his nursery and farm - a re known dialogue that went on for hours each time - a conversation we concluded only last week when we discussed when do we know we have really accomplished something? I told him I did not know the definition but I was quite sure it was him and his life's work! A smile and a wink and a sigh that he had so much more to do - always. I sit here tonight in his outrageous, breathtaking gardens of life and love and nature and care converging with such grace and natural dignity that I am overwhelmed by all of you who contribute to our natural world and find it truly the highest calling of all. Thank you for being "plants men" and "plants women" - you make the world so much more beautiful than many of us will ever know and yet it's solace at times like these, for me personally, is a truly spiritual experience of the utmost inspiration. A great tribute to a great plantsman - thank you!